Home > Upromise eCoupons > December Upromise eCoupons: Airwick, Charmin, Huggies & More! December Upromise eCoupons: Airwick, Charmin, Huggies & More! Here are this month’s Upromise eCoupons. Below you’ll find savings for all sorts of fun products: Musselman’s, No Yolks, Argo, Johnsonville, Bic and more! 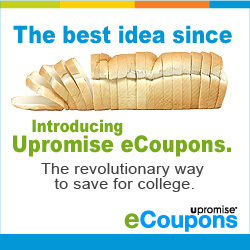 Upromise is great because all the money you save using these eCoupons can be used toward your child’s or grandchild’s college education. And you can use them with manufacturers coupons too. 3. Load all the coupons you want (have them saved for any purchases during the month! 4. Your coupons are available on every store card you have entered. So where ever you buy the item you’ll get your money back! 1. You can use them at almost any store! 2. The money does not come off at the register but is put in your Upromise account.